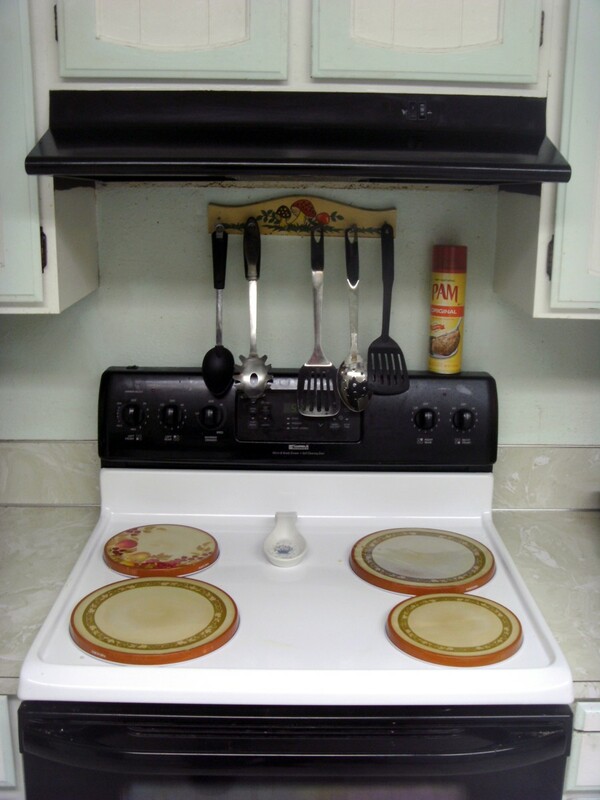 I have dabbled in home improvement projects and like giving advice to others on what not to do. 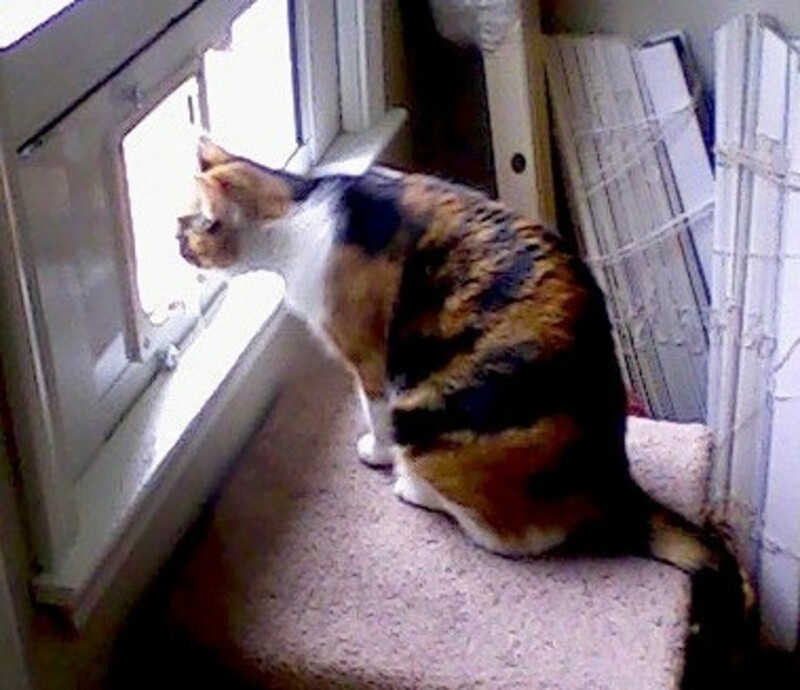 Are you tired of letting your animal friend in and out of the house? If so, perhaps you've dreamed about one of those nifty pet doors, but were deterred by the prospect of actually installing it. Well then, be reassured! It's neither expensive, nor difficult—even if, as was the case for my installation, not everything goes quite according to plan! We knew we wanted a cat door for our new kitten, and found that Petsafe makes a door suitable for a cat her size, available for less than $25. And we knew that we wanted to place that door in the wall. The package stated that the door was suitable for door and wall installation. The installation starts with locating and cutting the opening. 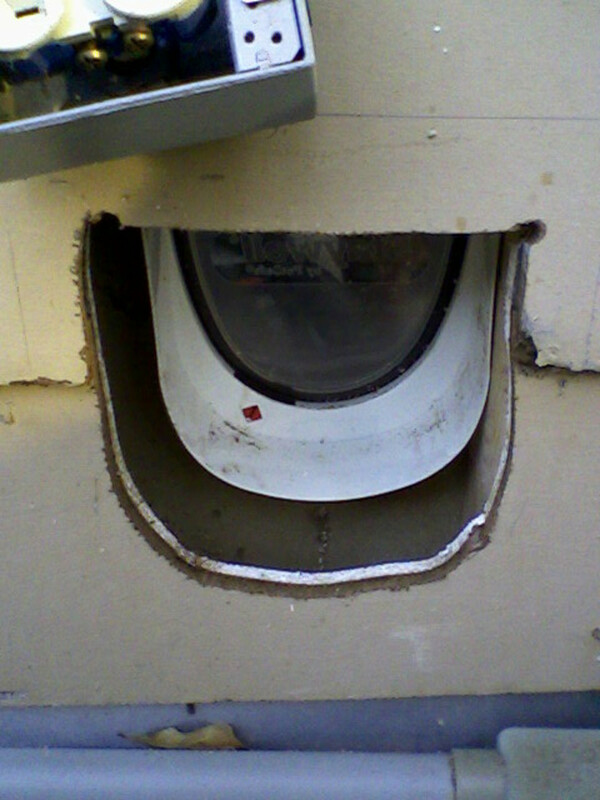 I began with the inside, since wallboard is not critical for weatherproofing and is pretty easy to patch if necessary. I found the stud inside the wall, and carefully cut an opening of the size given in the door installation instructions. I was particularly careful to insure that I didn't cut into any electrical wires in the wall! However, I should have been a little more careful yet. On the outside, as the above photo shows, my opening was crowded by an outlet box. Luckily, the box wasn't actually obstructing the opening, and could be freed from the wall by simply undoing a couple of screws, allowing me room to work. It could also be repositioned slightly when the door installation was complete. But that was an error you don't need to make! Check inside and out before you cut. Here's view of the completed opening, with a bit of a view through into the room. 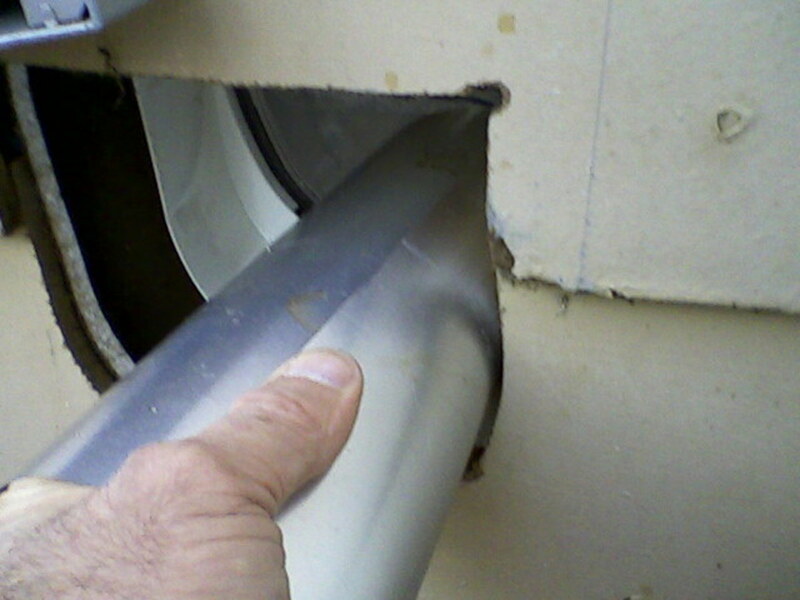 Aligning the inner and outer openings is important, and not as easy as you might think when doing a wall installation. After all, the wallboard and siding are about four inches apart. I used a carpenter's square and got pretty close. The biggest problem I had came from the fact that the stud next to the opening was angled slightly, and I didn't notice that. I had positioned the opening tight to the stud, and measured from there. 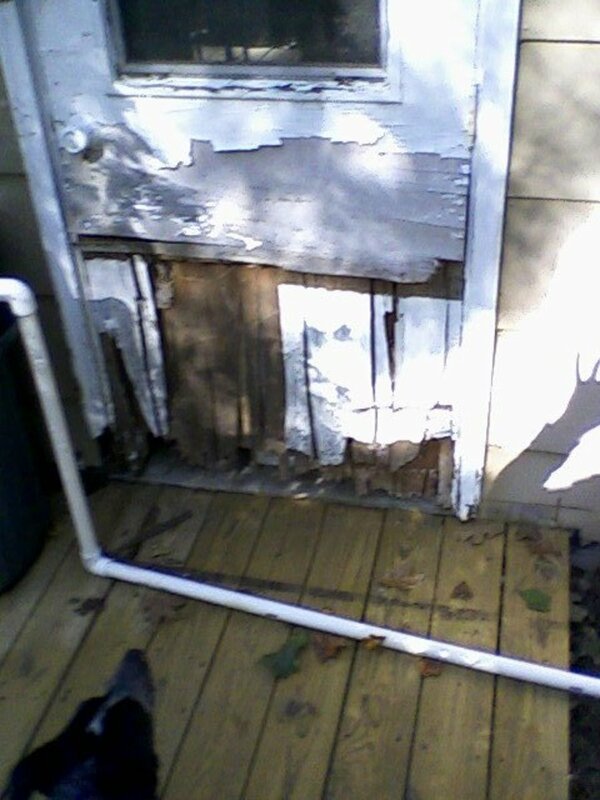 The result was that when the door was installed, it was on a slight angle, too. That meant that it didn't want to sit neatly against the inner wall, as it should. So, my recommendation would be to allow a little 'wiggle-room' if you are installing your door next to a stud or other obstruction inside the wall. It's always nice to have the intended user check out the project while it's still in progress! 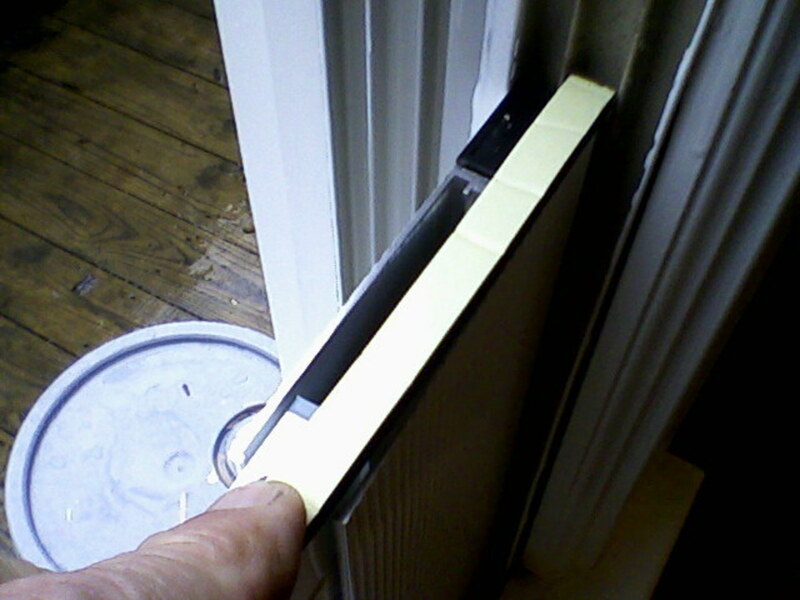 Here's the inner portion of the door test-fitted into the opening. You can see the slight misalignment mentioned above. You can also see the biggest problem with the installation—the door's built-in 'tunnel' is not long enough to reach the full width of the wall! 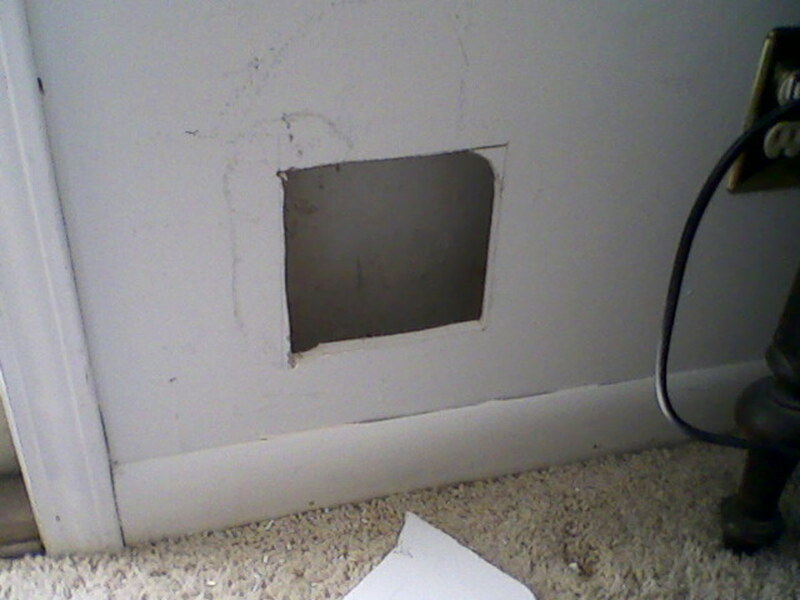 Since the four-inch wall is a universal standard in North America, I have to disagree with Petsafe that this door is suitable for wall installation as is. It's a nice little door—affordable, yet well-designed and well-built. So far, it's held up fine and operated properly, opening and closing as it should without even creating a draft. But for it to work in a wall, you need to add pieces not supplied. And that's what I did, as you can see below. 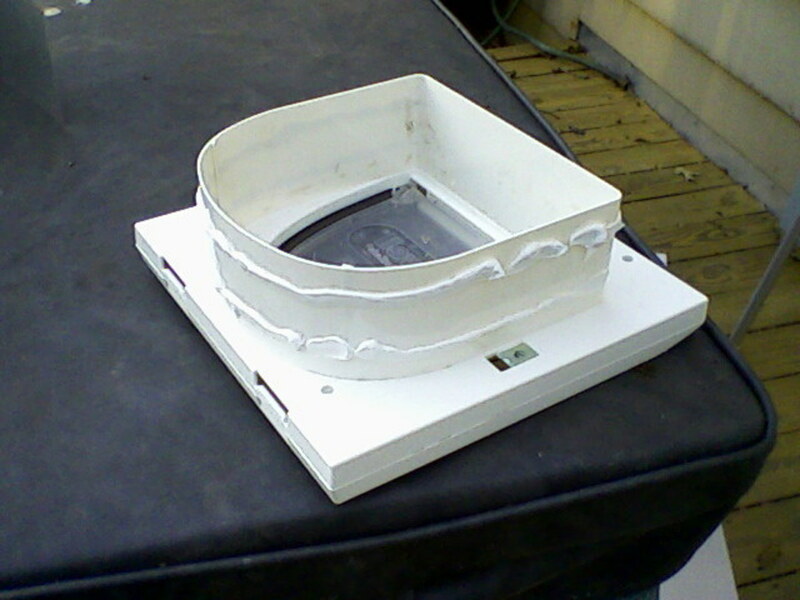 Here is the inner portion of the door, removed again in order for me to apply acrylic caulk around the outside of the 'tunnel.' My idea was to bond the aluminum to the plastic in this way, and to secure it temporarily from the outside with parcel tape. You can also see that I've added caulking around the edges of the opening. This will need to be touched up with paint, course. With that done, I installed the door, with attached aluminum, and then added another 'U-shaped' piece of aluminum on the inside of the door. 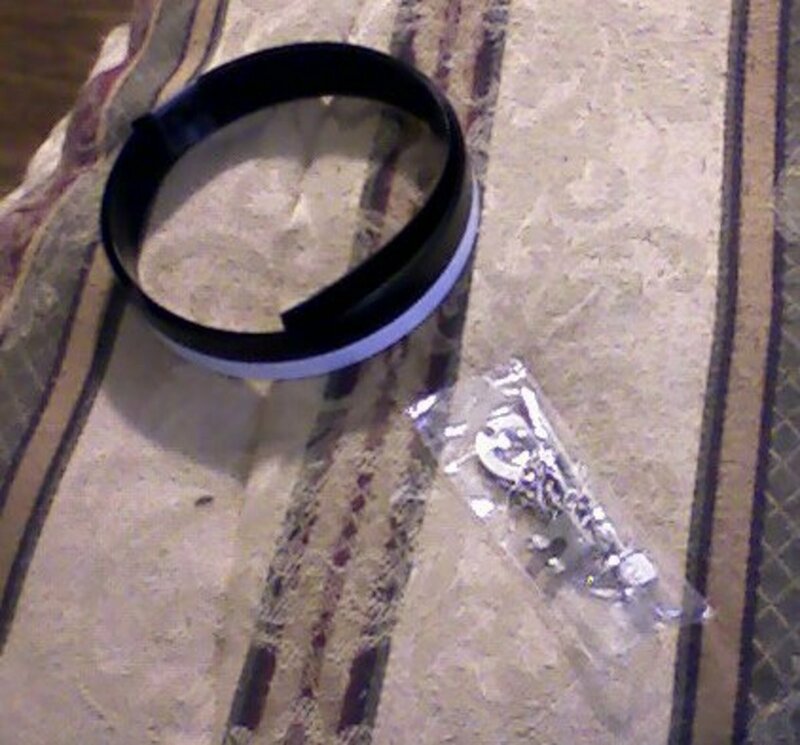 This is the piece which the cat will actually be walking on. 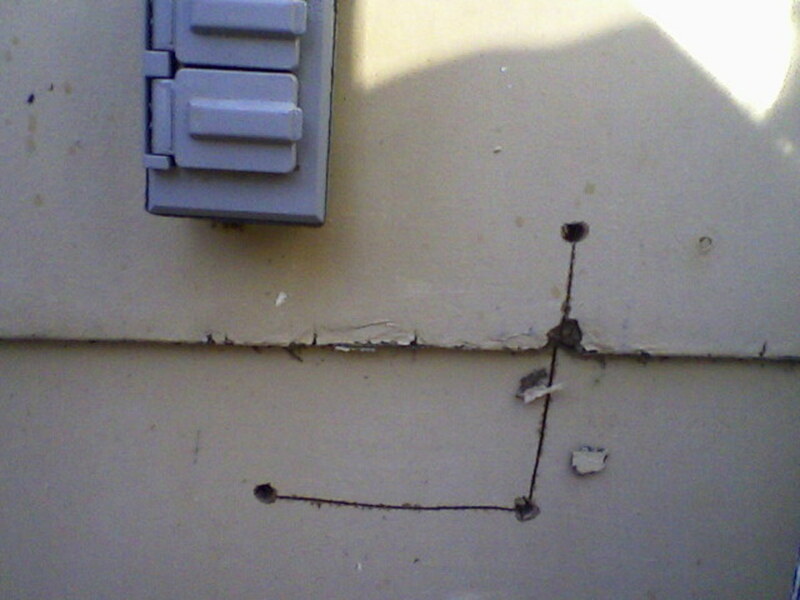 This piece is secured to the siding temporarily with more package tape. To complete the project the exterior needs to be weatherproofed. I chose to use a heavy-duty duct-tape in white for this. Starting with the bottom, and taking great care to avoid wrinkles or bubbles in the tape, I applied overlapping layers of the tape. It's a bit of a question mark for me how well this tape will hold up to weather and cat-traffic. 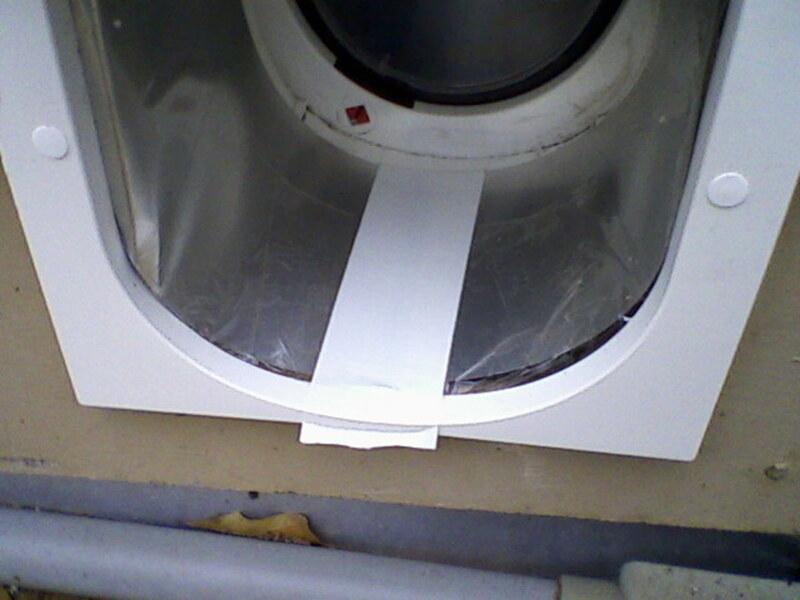 But the tape is eminently replaceable if the answer turns out to be 'not so well.' I'll update this Hub to let you know, when some time has passed. Hope it helps you and your furry friend! This arrangement worked well for us, for a matter of about two months. I think it would have worked much longer, as it had not deteriorated in that period. But early in April of 2011, we had a disaster. I'll be writing about it specifically later, and so will not go into it here. But circuitously, events led to the presence of a stray beagle in our home. While we were away, said dog evidently panicked. 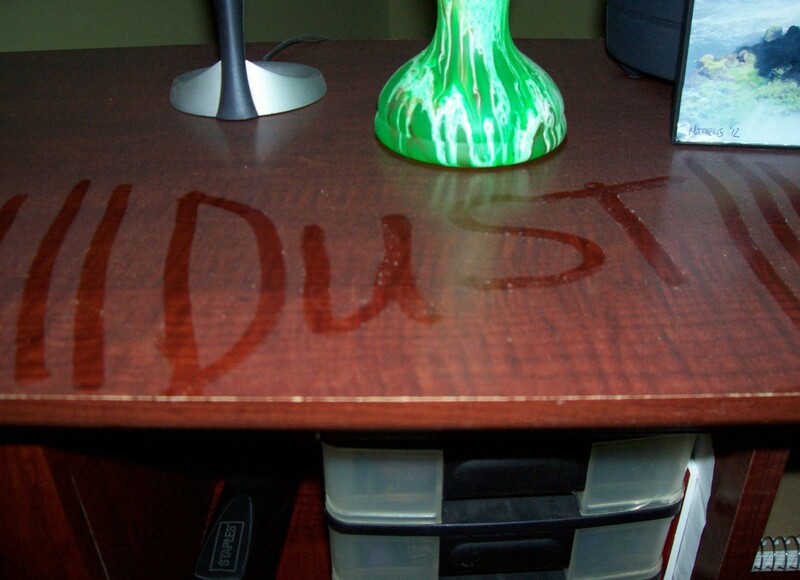 The photo below shows the result. 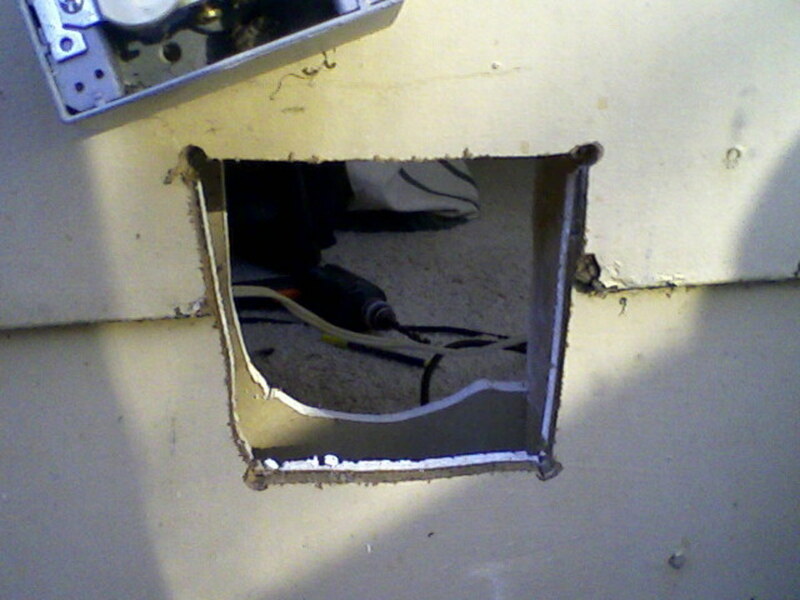 So, be aware that a Petsafe door mounted in drywall will not stand up to the efforts of a maddened beagle. 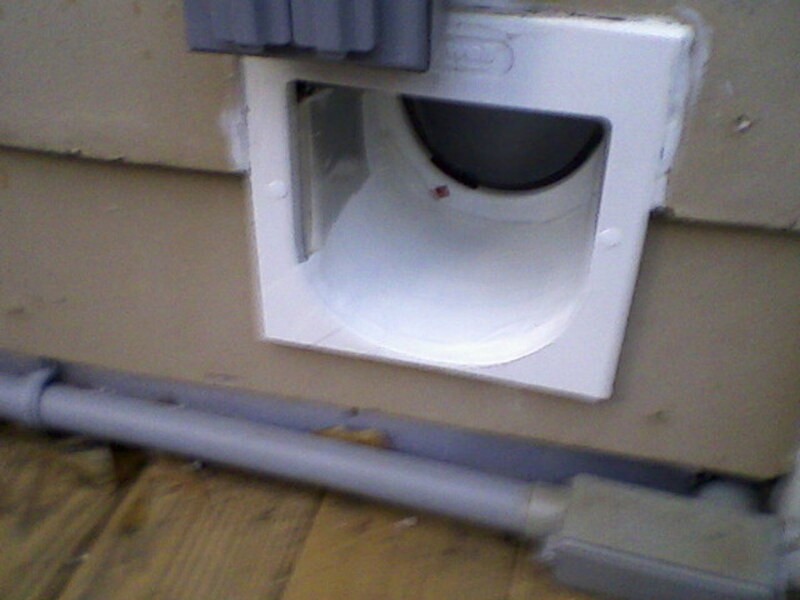 When the time came to replace the cat door, we decided to go with a window unit instead. They are considerably more expensive, but presumably are less susceptible to the particular 'failure mode' we had experienced. 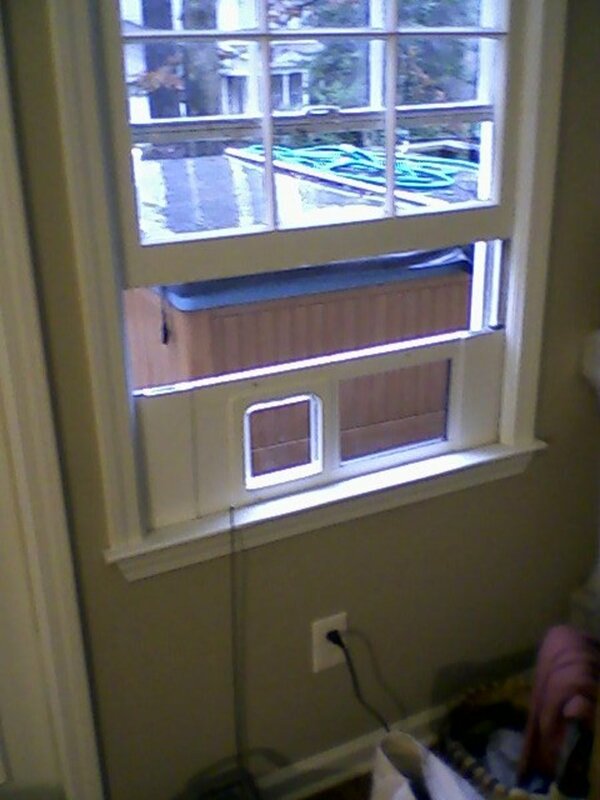 Online research led us to select an American-made unit from Ideal Pet Products, intended for use with sash windows. 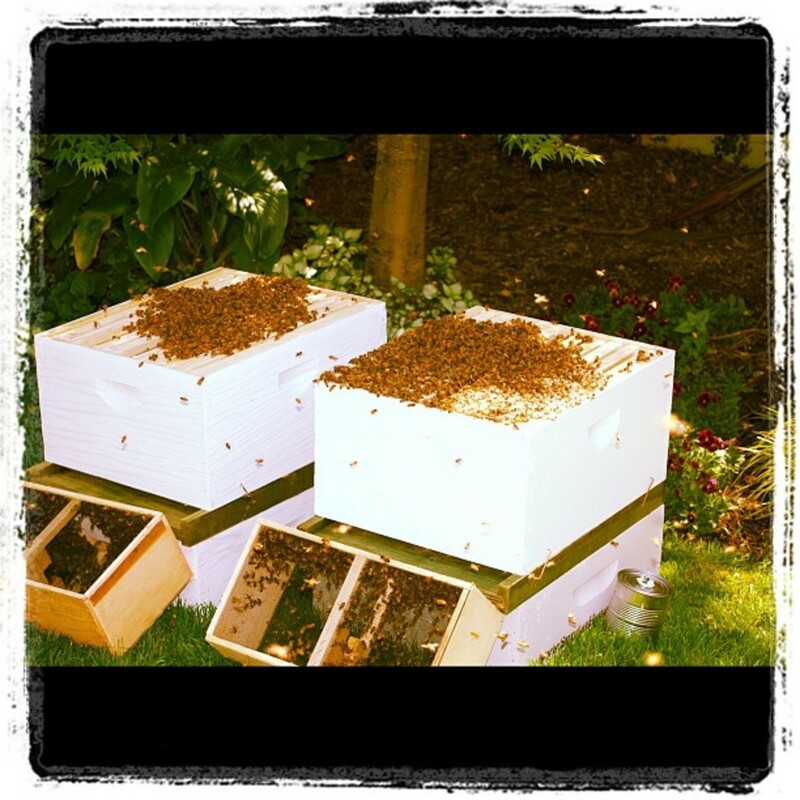 Ordering was simple, delivery was prompt, and installation—shown below—was fairly simple. Here's what you get. 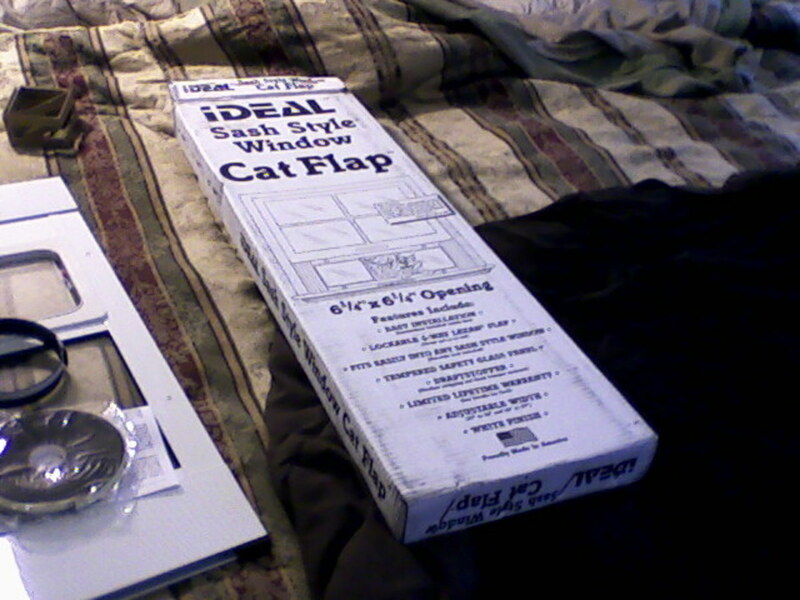 It's a compact package, and the directions are not too bad. First fitting of the unit into the window--and also my first mistake. Note the plain, unadorned surface on this inside view. Trouble is, there are locking knobs on this unit--it telescopes to adjust to the width of your window. I put them on the outside, where they would conveniently allow a burglar to unlock and remove the cat door, and so gain access to our home. You can see in the picture above how the unit fits into the window. 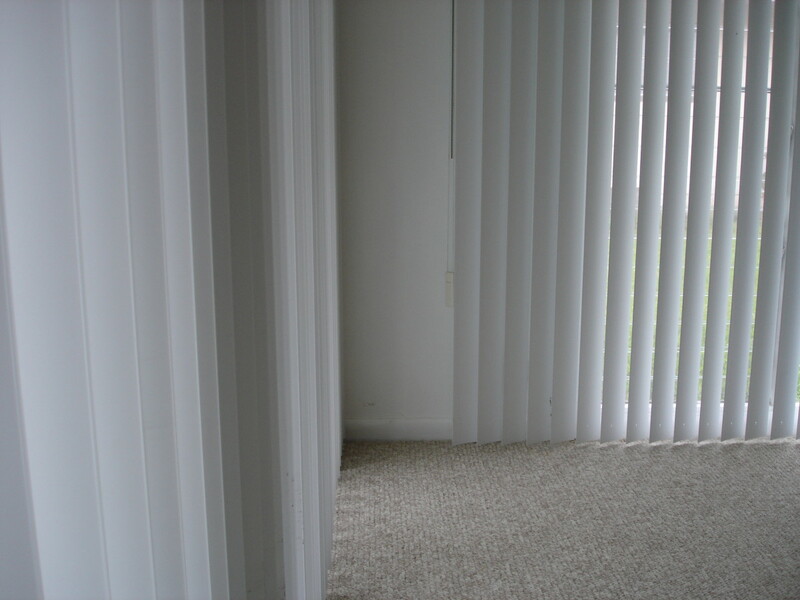 There are several sizes of these doors available to fit a range of window sizes, and useful measuring instructions are given on the Ideal website. I was a little apprehensive because our window was near the extreme of one size range, but as you can see, the fit was perfectly fine. 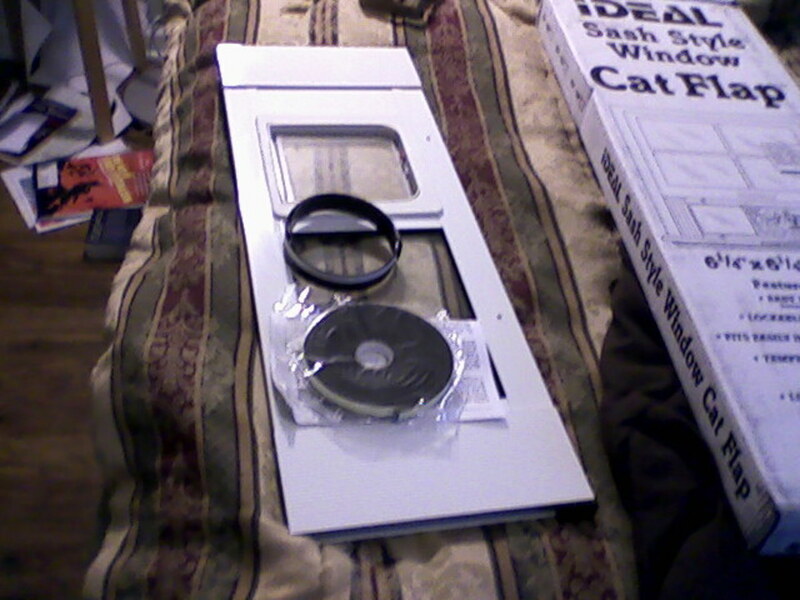 The cat door comes with ample weatherstripping to seal the gaps and eliminate drafts. Installation is a bit awkward, though I don't think that is the fault of the designers—it's just going to be a bit of a challenge to prop up the unit, and then to get the stripping cut to the correct length and pressed down straight, solidly, and without 'bubbles' along the entire length of the opening. 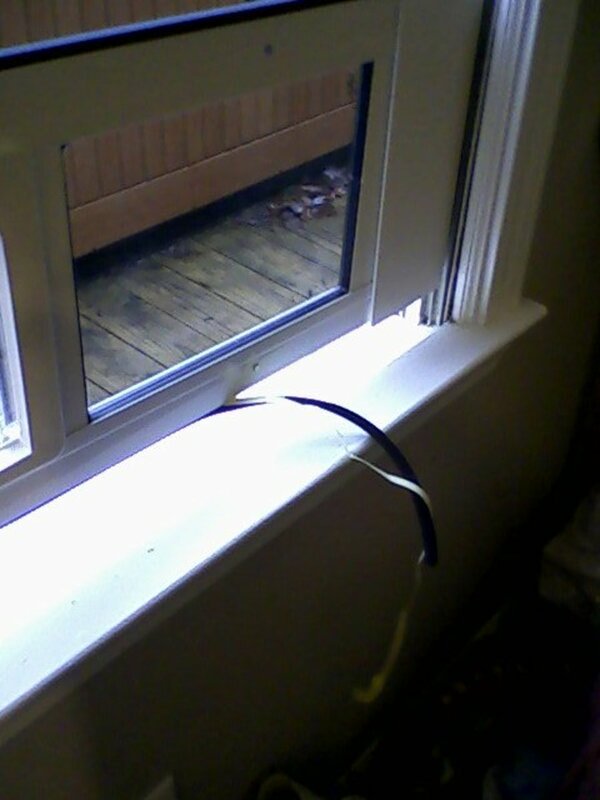 Wait, what's that cord coming from the outside? 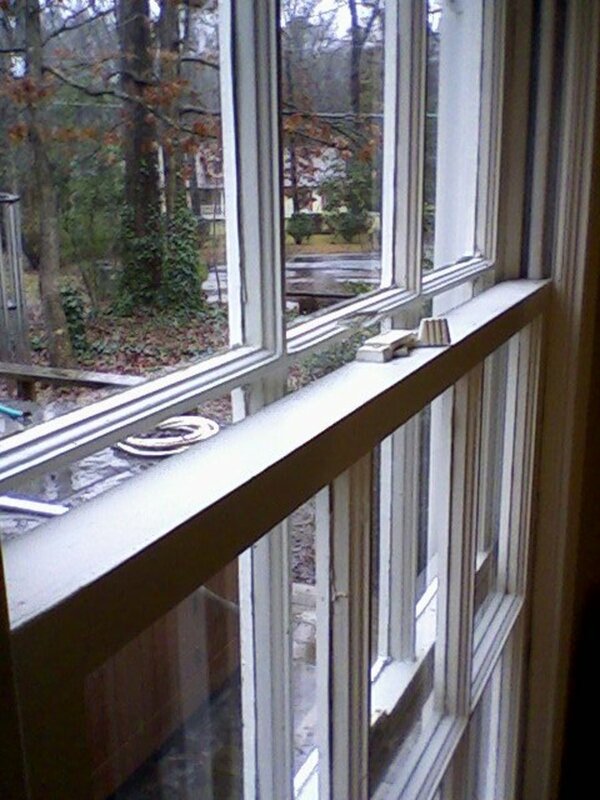 Speaking of drafts, there's a source of them that you will have to deal with--the gap between window panes, as shown below. 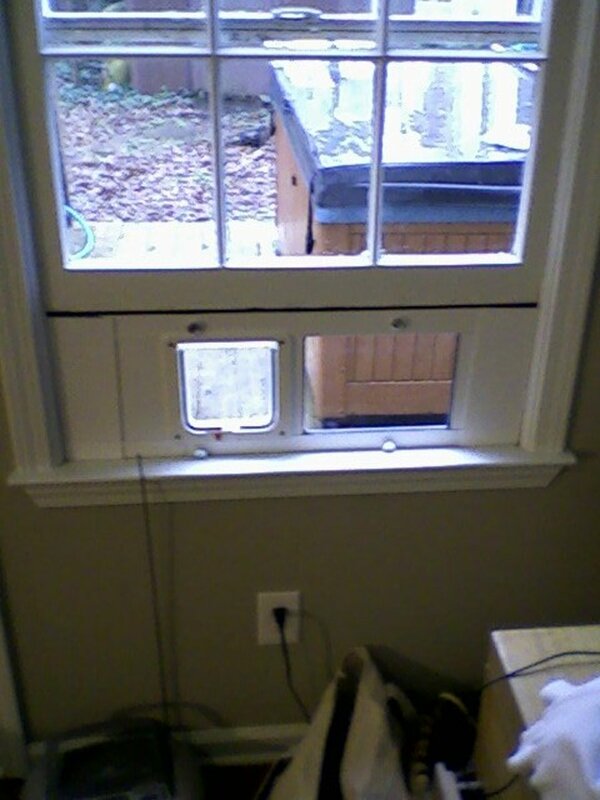 The cat door is in line with the inner pane, allowing cold air to infiltrate between inner and outer panes, into the room. 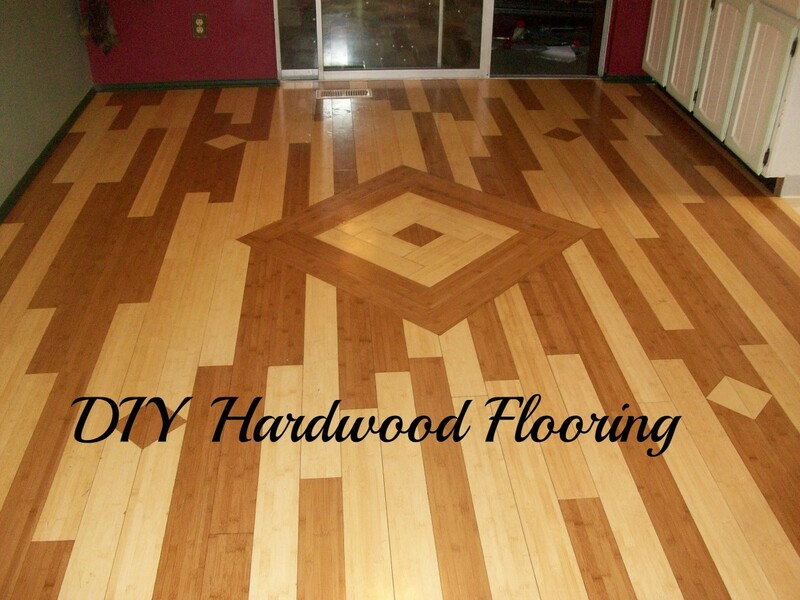 There are instructions given for dealing with this situation, but since in our case the fit happened to allow a 'wood-to-wood' connection, I decided to use a solid strip to block this avenue. To do that I removed the latch hardware on top of the sash--a simple operation. 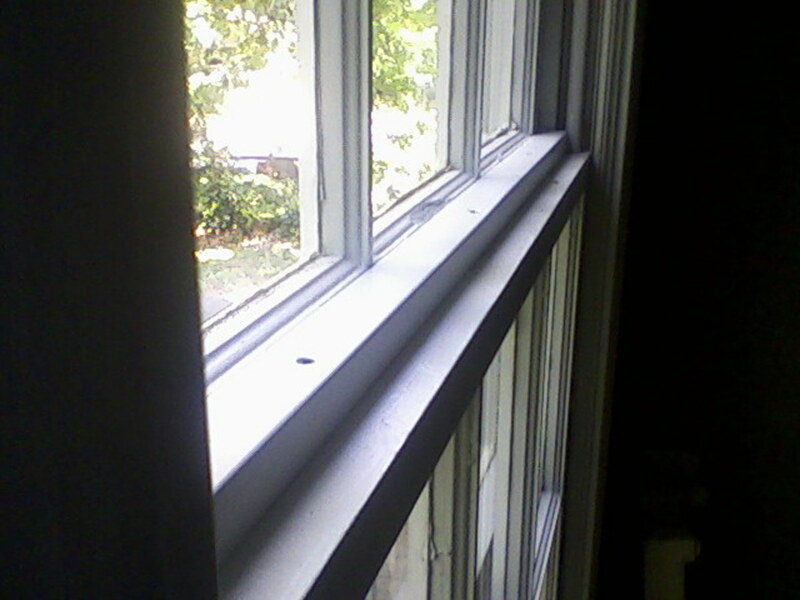 This enabled the firm attachment of the various sliding bits with wood screws, increasing the security of the window. You can see the strip in the picture below. It has been quite effective. All told, the installation of this unit probably took well under two hours, and could be done much faster. (I was very cautious at every step! 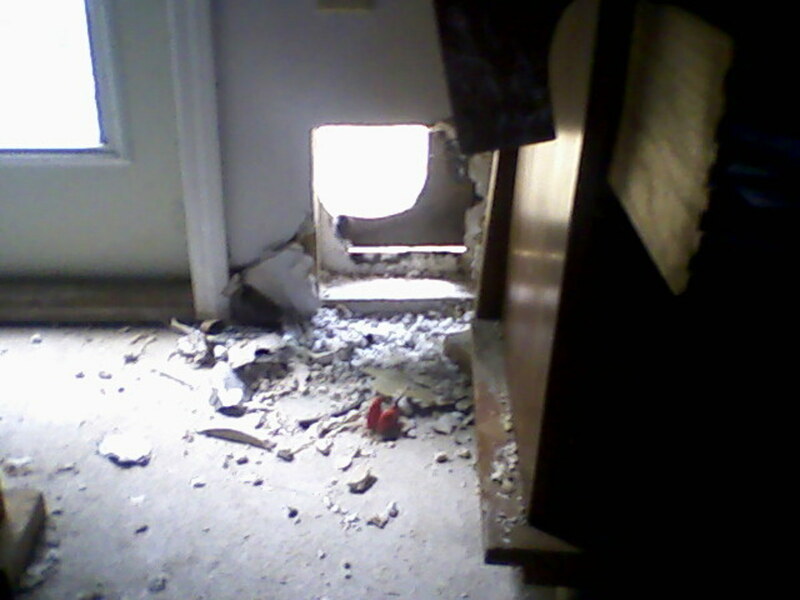 Well, every step after putting the door in backwards initially, at least.) Installing this unit should be well within the capability of most readers. We haven't subjected it to the 'crazed beagle' test--and will make strenuous efforts not to do so in the future. 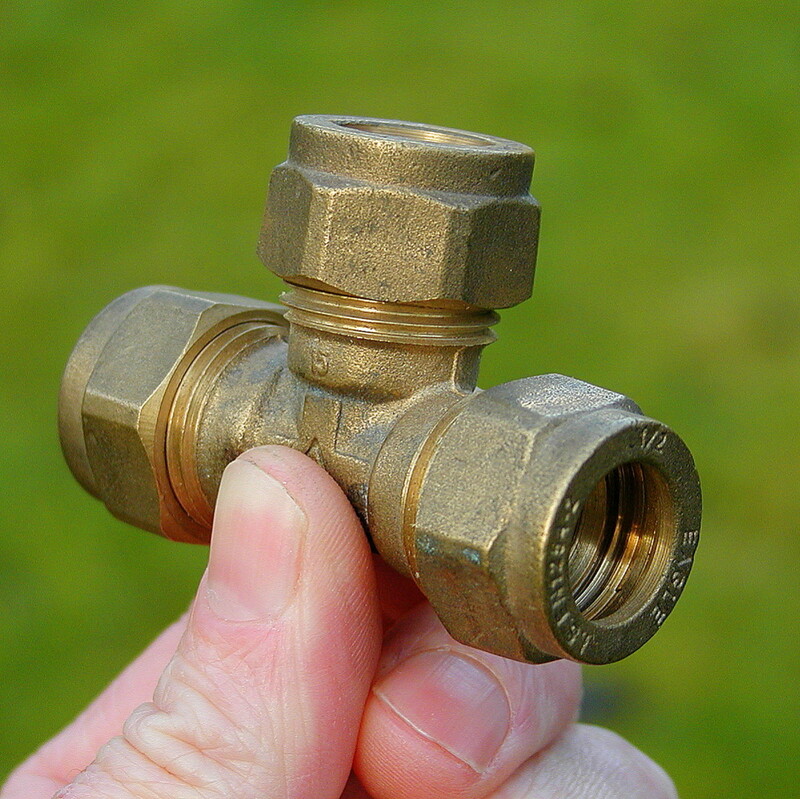 But this unit has performed well in all other respects. As you can see, the primary user is quite happy with it! Readers should be aware that the link given in the comment below is pretty clearly a commercial one. But it does offer useful tips even though it's all focused on one company's products, so I'm letting it stand. Thanks so much for this article! I have been searching for ideas on how to do my own http://www.greatcanadian.ca/services/windows-and-d... and doors installation in Calgary and this is just what I needed! Thanks again! What I should have measured--even once--was the door tunnel. Trust me, everything I *did* measure was done according to your advice! 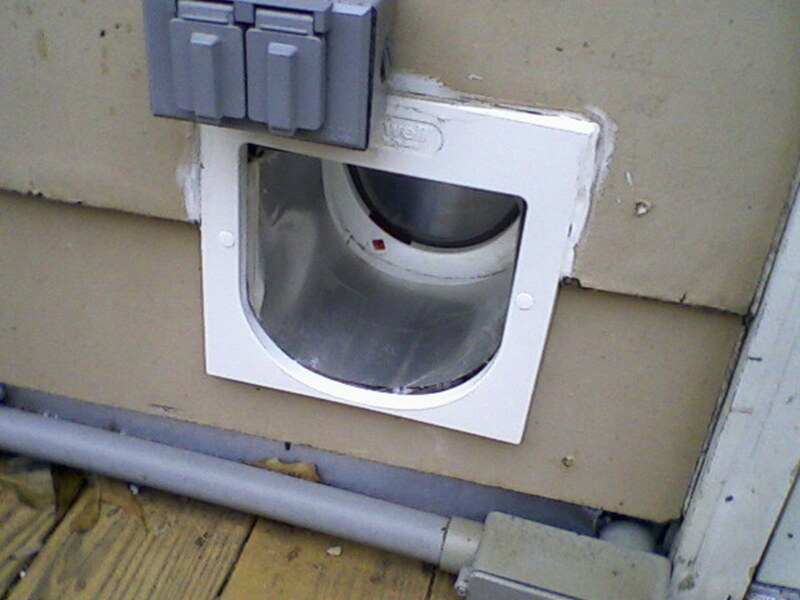 The rule is when fitting anything or cutting is 'measure twice and cut once' Looks like you could do to use this method when next fitting a cat door.Very informative though and will prevent other people making the same mistakes. Thanks, 'hello!" Yes, it would be good to find a unit that was better-designed for wall installation. The question I still have is, how will this hold up over time? One last thing, which I found pretty funny. 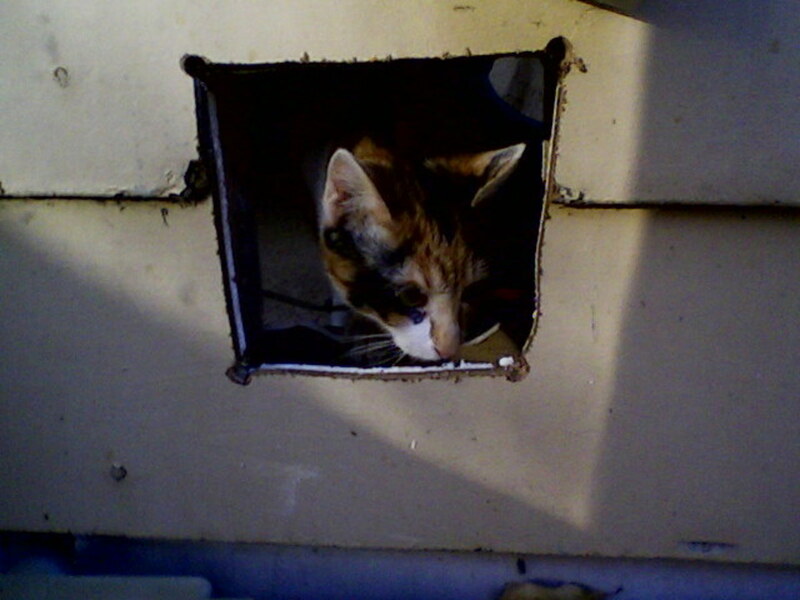 The other day I was in the room and heard the cat door operate (the door is held closed by magnets, and there's a clicking noise when it opens or closes.) I looked around to see the cat. . . and instead found myself staring eye to eye with our 40-pound dog, Rambo! His entire head up to the eyebrows was inside the room. He can't fit through the door, but apparently wanted to see what was going on inside. 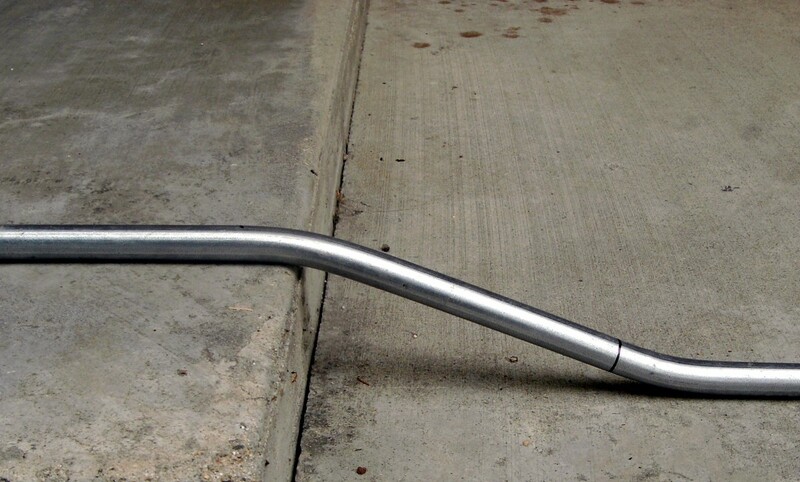 Good thing his head didn't get caught when he pulled it back outside!